Mayflower pilgrim William Bradford wrote a detailed manuscript describing the pilgrim’s experiences in the New World, now known as Of Plymouth Plantation, between the years 1630 and 1651. In the 270 page manuscript, written in the form of two books, Bradford recorded everything from the pilgrim’s experiences living in the Netherlands, to their voyage on the Mayflower and their daily life in Plymouth colony. 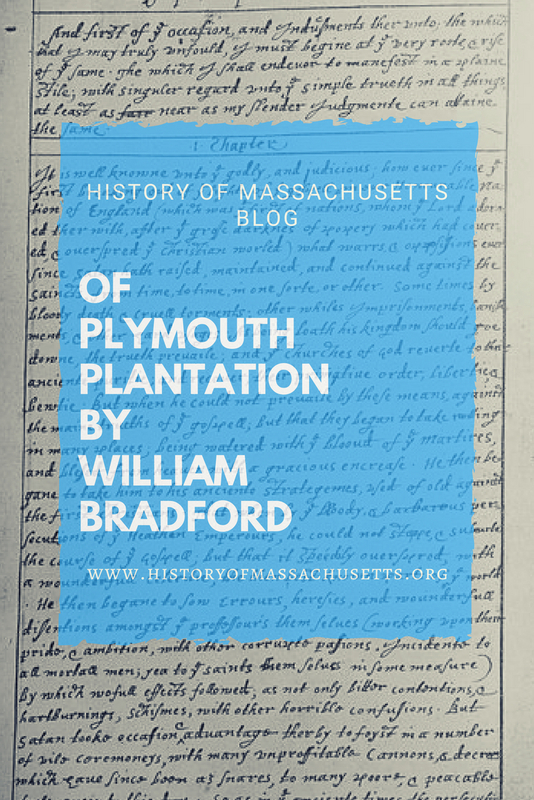 The manuscript is known by many names, such as The History of Plymouth Plantation, History of the Plantation at Plymouth and William Bradford’s Journal. Bradford never made any attempt to publish the manuscript during his lifetime and instead gave it to his son William, who later passed it on to his own son Major John Bradford. 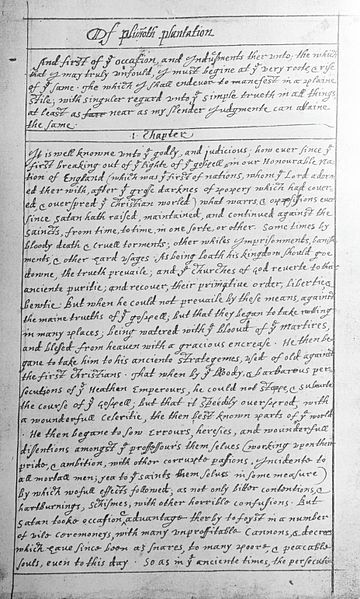 A number of people borrowed the manuscript over the years, such as William Bradford’s nephew, Nathaniel Morton, who referenced it in his book New England’s Memorial in 1669, and later Reverend Thomas Prince, who used part of the manuscript in his own book Chronological History of New England in 1736. During its time at the library, William Hubbard borrowed the manuscript and referenced it in his book History of New England, as did Thomas Hutchinson, who used it as a reference for his book History of Massachusetts Bay in 1767. What happened next to the manuscript is unclear. At some point in the late 1700s, the manuscript disappeared. It remained missing for over half a century until it was discovered in the Bishop of London’s Library at Fulham in 1855. According to editor Charles Deane, in the editorial preface of the 1856 edition of History of Plymouth Plantation, the location of the manuscript was discovered by Reverend John Barry, a historian working on the first volume of his book History of Massachusetts. Deane promptly wrote a letter to Reverend Joseph Hunter, one of the Vice-Presidents of the Society of Antiquaries of London, asking him to find out whether the document in the Bishop’s library was indeed Bradford’s original manuscript. Despite the revelation, the British government didn’t offer to give the manuscript back and instead created a copy of it, which it sent to Boston in August of 1855. The copy was published soon after in 1856 and, due to its description of the First Thanksgiving at Plymouth, sparked a sudden interest in the Thanksgiving holiday, which was up until then only a regional New England tradition and not the national holiday it later became. The discovery of the original manuscript ignited a long debate between British and American scholars about its rightful home. The debate raged on for over 40 years while politicians, such as United States Senator George Frisbie Hoar, a member of the American Antiquarian Society, made multiple failed attempts to have the manuscript returned to the United States. Finally, after Massachusetts Governor Roger Walcott filed a formal petition with a London court asking for the return of the manuscript, the British government agreed to return it to Massachusetts in April of 1897, over 100 years after it first went missing. The manuscript now resides at the Massachusetts State House. Bradford, William. Bradford’s History of Plymouth Plantation, 1606-1646. Vol. 10, Edited by William T. Davis, 1908. Johns Hopkins University Studies in Historical and Political Science. Vol. I, Edited By Herbert B. Adams, The John Hopkins Press, 1883. Bradford, William. History of Plymouth Plantation. Edited by Charles Deane, 1856. “The Pilgrim Myth: The Legends About the Forefathers Persistently Defy History.” Life Magazine, 26 Nov. 1945, pp. 51-57. Searching for details concerning, was William Bradford a slave owner?